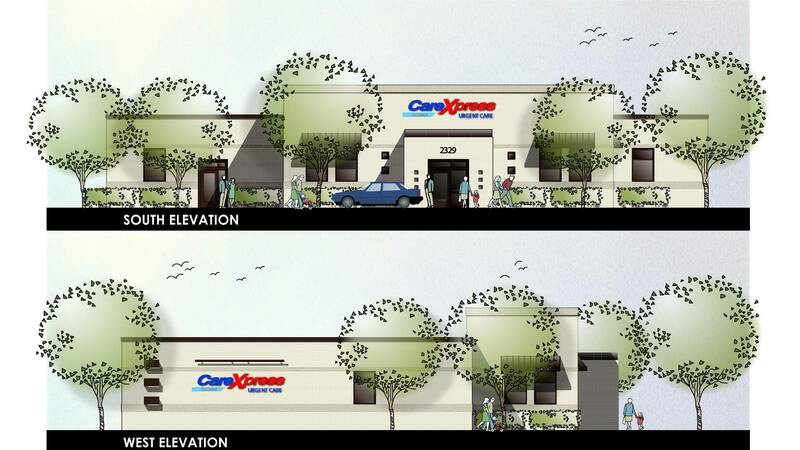 CareXpress broke ground Thursday for its seventh Amarillo clinic on property at 2329 Ross-Osage Street. It is expected to open this fall. The clinic will run slightly more than 8,000-square feet and will contain two treatment and procedure rooms, three drug-testing stations, five occupational medicine examination rooms, one audiology suite, four urgent care exam rooms, five blood-drawing stations, and a digital X-ray area, according to information from CareXpress. The entry also will feature separate waiting areas for patients who are sick and those who visit the clinic for occupational medicine services. CareXpress will provide Department of Transportation exams and screenings by providers with certifications from the National Registry of Certified Medical Examiners, a Federal Motor Carrier Safety Administration program, the release said. Occupational medicine services will include drug screenings, blood-alcohol tests, blood draws and pulmonary function testing. The Ross-Osage location is the fourth to offer occupational medicine services. Sites in Canyon and in Amarillo at Southwest 34th Avenue and Coulter Street and inside United Supermarket on South Soncy Road also offer occupational medical tests. CareXpress is a service of FMC Medical Foundation that has six locations, including the Canyon clinic. They operate daily, around the clock. * Karen Welch is senior content producer for Panhandle PBS. She can be reached atkaren.welch@actx.edu, @KWelch806 on Twitter or https://www.facebook.com/KarenSmithWelch.